BANGI, 4 November 2014 – “This Master’s degree is not only for me but is a victory for everyone with my condition”, said Siti Haslina Mohd Shafie, a small person, who receives her scroll today on the final day of the 42nd Convocation of The National University of Malaysia (UKM). She suffers from growth hormone deficiency, thus her small size. People like her are commonly known as midgets though her achievement is nothing small. She was emotional when she recalled memories about growing up and in school. “I have been called names some even nasty, my abilities ridiculed but today I proved that even small people like me can succeed academically. “I hope this will encourage other small people that they do not have to be defined by their size. 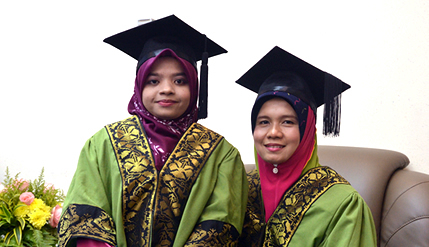 They can be whatever they want to be”, said Siti Haslina, who received her Masters of Philosophy in Geography today. Asked about her plans, she said she is currently pursuing for her doctorate. Another small person who graduated with a Masters today is Khadijah Abu Samah. She is a teacher who took time off to complete her Masters in Malay Language Studies. Khadijah is married to Abd Halim Hapiz who is also a small person. They have two children with the same condition and Khadijah felt it very important to earn her Masters to prove to her children that being small is no barrier to studies. She said her husband is her backbone and strength enabling her to complete her studies. He took care of the kids, family and even put his career on the back seat. She is not just small but her legs are very short and she could not bend. So her husband, Halim drove her around and helped her to finish her Masters. She said the degree maybe in her name but it is as much her husband’s as it is hers. She said it is time for her to do the same for her husband. Halim said Khadijah’s success is not just for her but is also for all the little people like them.